The Osun State Command of the National Drug Law Enforcement Agency, on Thursday, stated that it had seized 73 bags of marijuana from illicit drug spots in Osogbo. 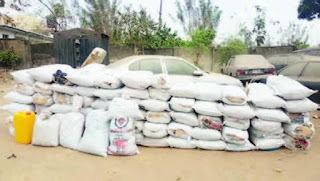 The commander of the agency in the state, Samuel Egbeola, said the seizure was aimed at ensuring that illicit drugs and their abuse were not allowed to undermine the forthcoming general elections in the state. Egbeola said during the raid of notorious illicit drugs spots within the Osogbo metropolis, 73 bags of cannabis, weighing 692.6kg, were recovered. He added that a suspect was arrested during the raid and was currently assisting the agency to apprehend others involved in the illicit business. The statement read in part, “In preparation for the 2019 general elections, the National Drug Law Enforcement Agency, Osun State Command, has embarked on mop up of illicit drugs in the state. This is to ensure that illicit drugs are not abused to undermine the 2019 general elections. Efforts in this direction led to the arrest of several suspects and the seizure of 73 bags of cannabis, weighing 692.6kg, within the Osogbo metropolis on January 23, 2019. “One male suspect was arrested in connection with this huge seizure and he is providing useful information on the activities of other illicit drug dealers.